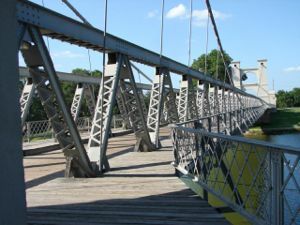 We recently paid a visit to one of our favorite spots, the old suspension bridge in Waco, and took a couple of photos. The information below is from markers and plaques at the bridge. In 1866 the Waco Bridge Company was granted a 25 year charter to build a toll bridge here. The charter guaranteed that no other bridge or ferry could be built within five miles. Construction began in 1868 and, after much financial difficulty, was finished in 1870. Bridge traffic included wagons, pedestrians and cattle herds. Special rates were given to heavy users. From 1875 to 1889 the public agitated for a free bridge, but the company retained its monopoly. 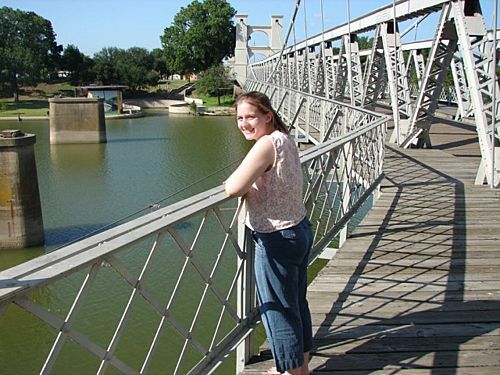 Then, in 1889, the bridge was sold to McLennan County, which gave it to the city of Waco as a free bridge.